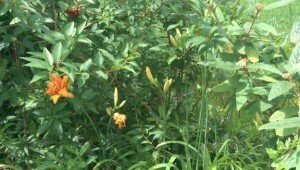 Last month I posted a Nurturing Thursday entry with a photo of yellow daylilies in bloom next to my house. I mentioned in the comments that I also like orange lilies, but had not planted any. 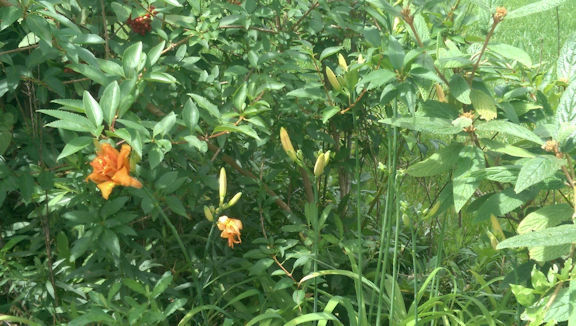 Much to my surprise, this week I found lovely orange lilies blooming in a gap in my neighbors’ hedge (shown in this post) where the deer trampled down the bushes long ago. Just gorgeous! I don’t know whether the neighbors planted the lilies recently, or maybe they were there all along and never grew enough to bloom because the deer always stepped on them. I haven’t seen any deer walking through the hedge this year, probably because construction of new homes changed their usual paths. So it looks like the hedge is finally going to grow together, with orange lilies as a bonus, yay! Sometimes when we wish for things, they really do show up. Yes, it’s best when things just spontaneously show up with no waiting! I would hope so, but one never knows! Wild morning glories are pretty, but I wasn’t happy when some of them invaded my roses a few years ago. I’m still finding them and having to pull them out! They do show up! Wonderful orange lilies! I’m glad it found a good space! My mom had a lone daylily bloom today — guess she was letting us know she was with us, as we continue to clean out her house. We stopped to weed around her patio in remembrance, and a chance to “ground” ourselves for the day!